After the signing of the Oslo II Agreement, an airport was built in Gaza. Modeled after Mohammed V International Airport, the facility, which ceased operation in 2001, was designed and constructed by Moroccan architects and engineers funded by King Hassan II. Signed officially on September the 28th, 1995, the Oslo II Agreement, which was part of a series of agreements that envisioned the establishment of a Palestinian interim self-government in the Palestinian territories, brought hope to the Palestinian people. The accord paved the way for Gaza’s notorious International Airport, which was build by Moroccans. A report by Agence France Press recalled the history of the facility known now as Yasser Arafat International Airport, which symbolized, according to the agency, a step forward towards independence. Inaugurated on November the 24th, 1998, with the presence of the President of the Palestinian National Authority Yasser Arafat, US President Bill Clinton and Prince ben al-Hussein of Jordan, the Gaza International Airport presented that light at the end of the tunnel for Gazans. «It’s great to have an airport, […] our airport. We prefer to travel from here, instead of having to go through Egypt or Turkey», a Gazan told the Associated Press. The construction of the airport was financed by Japan, Egypt, Saudi Arabia, Spain and Germany, and the total cost amounted USD80 million. But the facility ceased operation shortly after its opening. In 2001, the Israeli Defense Forces bombed the airport, severely damaging it. Morocco contributed, by its turn, to the construction of the Gaza International Airport. In fact, King Hassan II funded Moroccan architects to design the building which was initially modeled after Mohammed V International airport, located in Casablanca. Architect Amin El-Ori headed the Moroccan team, which built the airport in a Moorish style, fusioning it with other aspects of the local architecture : Moorish-inspired gates, and mosaic tiles and walls. The building had a golden dome which was referring to the Dome of the Rock in al-Quds. Once opened, a Royal Air Maroc plane was the first to land in the Gaza International Airport, which looks completely destroyed nowadays. 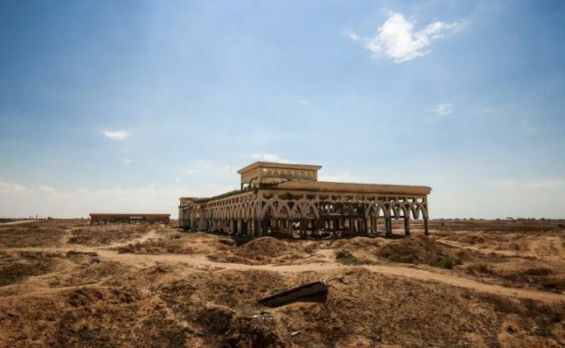 After the Gaza airport closed its doors, the Gaza Airstrip became the only serviceable runway in Gaza. The latter was also abandoned in 2004.